Sang "Onra Renda" from Kaaka Kaaka for the "Hats Off Harris" event at Nehru Indoor Stadium on 26th December. 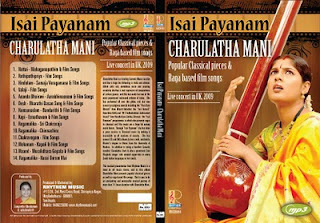 New DVD - "Raga Sangamam"
"Isai Payanam with Charulatha Mani"
Attendees receive Free Copy of Charulatha's latest album, "Gomathi"
The fourth installment of Sahithya Payanam was held at Vani Mahal on 13th November. 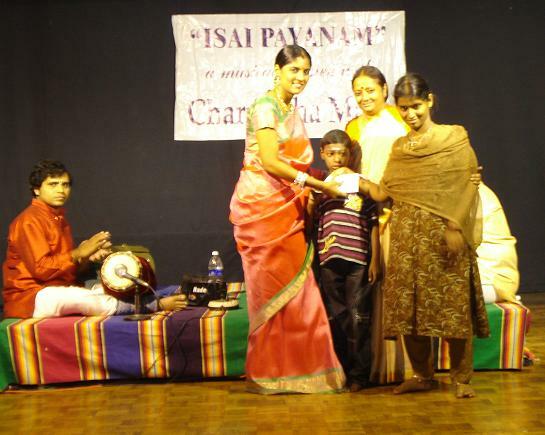 The concert was preceded by a donation by the Isai Payanam Trust (Regd.) to "RASA" - a special education school that reaches out to developmentally disabled children in Chennai through dance, music, and art. RASA is run by Bharatnatyam dancer Dr. Ambika Kameshwar. 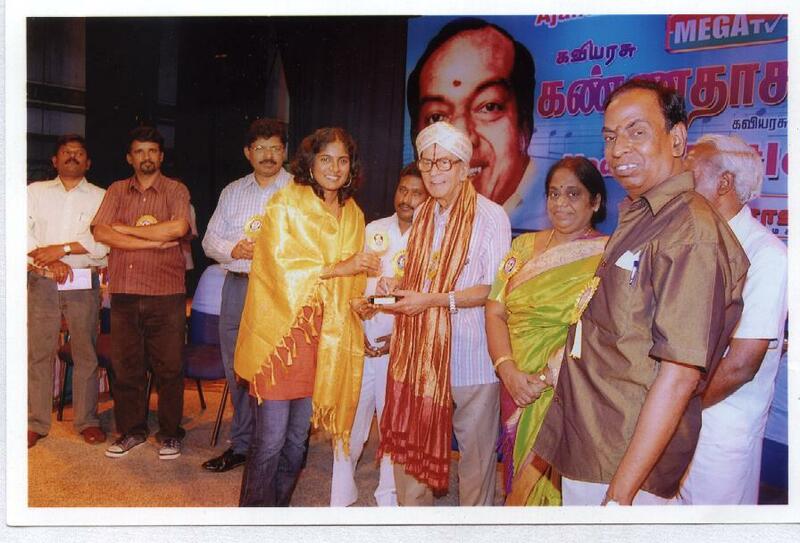 Winner: Smt Vijayalakshmi Ganesan, Triplicane. Congratulations!! 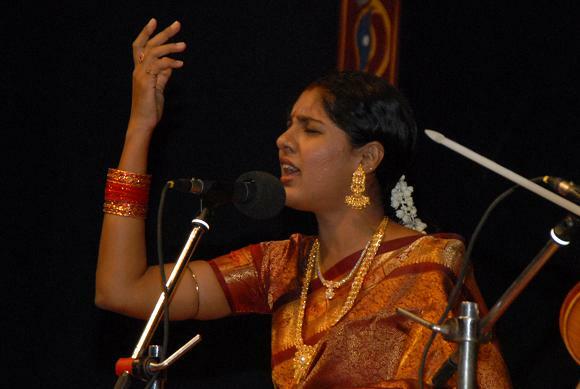 The next Sahitya Payanam concert #4 is at Thyaga Brahma Gana Sabha, Vani Mahal, Obul Reddy Hall on Nov 13th, 6:30 pm. Await the quiz! Isai Payanam Trust (Regd.) team. On October 31st 2010 I performed the Sahitya Payanam concert at R. K. Swamy Auditorium, Mylapore. I performed "Pranamamyaham" in Gowla, "Panchashat Peetha" in Karnataka Devagandhari, "Todudaiya Seviyan", "Venkatachala Nilayam", "Raghuvamsa Suthambudi", "Sakala Graha" in Atana, "Shankari Shankuru" in Saveri and finally "Baro Krishnayya", a Ragamalika. Oct 31st being MLV's rememberance day I sang a few pieces popularised by her. All these pieces were preceded by interesting anecdotes regarding the composer, composition, the meaning, as well as side stories from the puranas and ancient scriptures. The audience thoroughly enjoyed my speech as well as music. I was enjoying myself too; it is truly divine to understand and impart to all the glorious lyrical beauty contained in the treasure trove of Classical music. 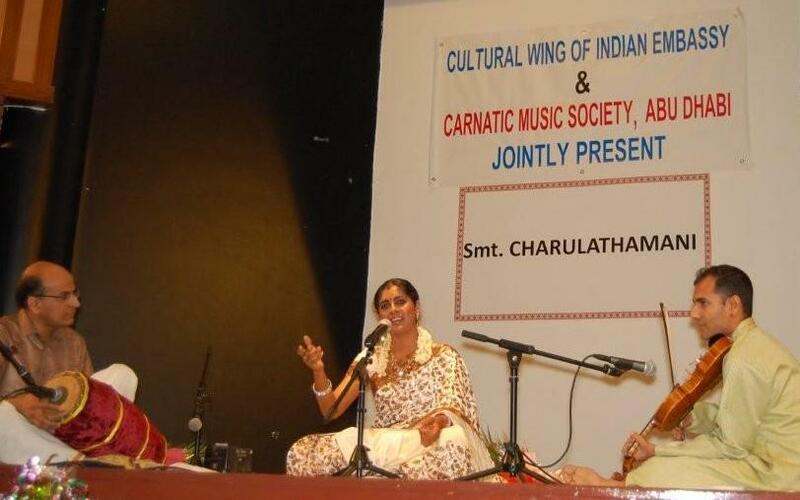 The concert was preceded by the presenting of a cash award from the Isai Payanam Trust to veteran Tambura artiste Ms. Vijayalakshmi as token of appreciation for her services to Carnatic Music. 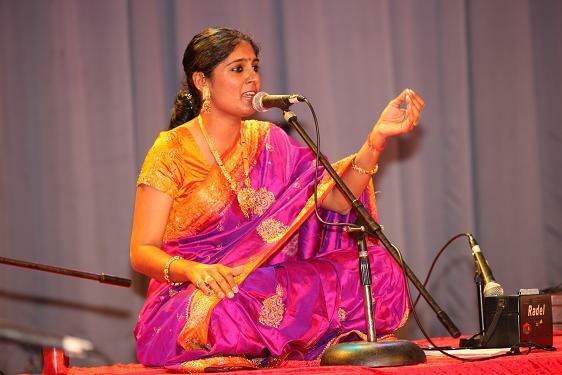 In addition to accompanying many musicians on the tambura, Ms. Vijayalakshmi is also an accomplished singer, having sung in film choruses in her younger days. By the way, hope you all had a great Diwali! I am sure you did!! I am still gorging on the sweets made with tonnes of love, lots of cashew, raisins, sugar, ghee by my dear grand mother. The mixture and then kuzhal were lovely too. I have to head to the kitchen right now, feeling very peckish!! 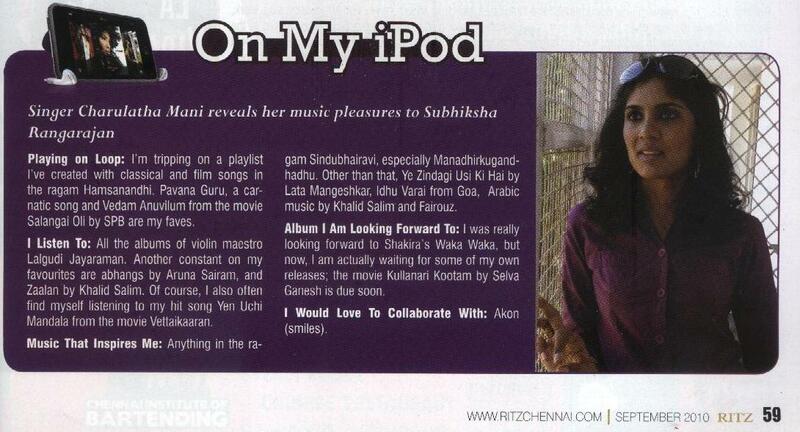 The Isai Payanam journey for me has been a very memorable and exciting one. 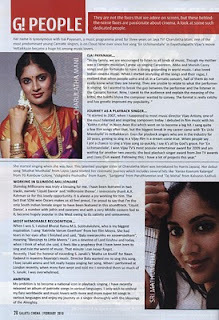 Unraveling the beauties and demystifying ragas in Classical and Film Music has helped me gain insight into both systems as a rasika, as a critic, as well as mould myself as a performer who can handle all genres of music. I am able to delve deep into ragas one at a time, and this unhurried thorough approach has made me a more mature and wholesome musician. In this edition of Isai Payanam, the fourteenth of the series I presented ragas Atana, Hamsanandi, Bhairavi and Desh, their striking features, classical and semi-classical pieces in them as well as well-loved film songs (Tamil and Hindi) that feature in them. The turn-out as usual was huge, including some standees, and all of us had a great time. 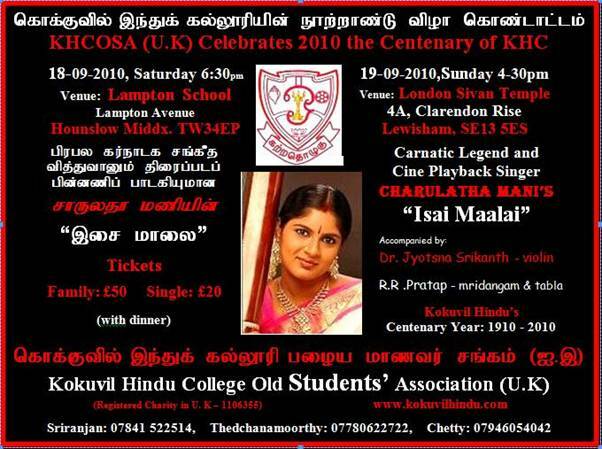 I love my audience who come with such enthusiasm for my Isai Payanam concerts and cruise with me. Their appreciation and spontaneous participation spurs me to set higher standards for myself and this show. You shall soon see a commercial release of this concert in DVD format at music outlets. I once again realised that evening the importance of one mantra that has always come back to me in moments of intense artistic emotion -Music is always greater that the musician!...To be an instrument in the hands of art is indeed a gift from above. 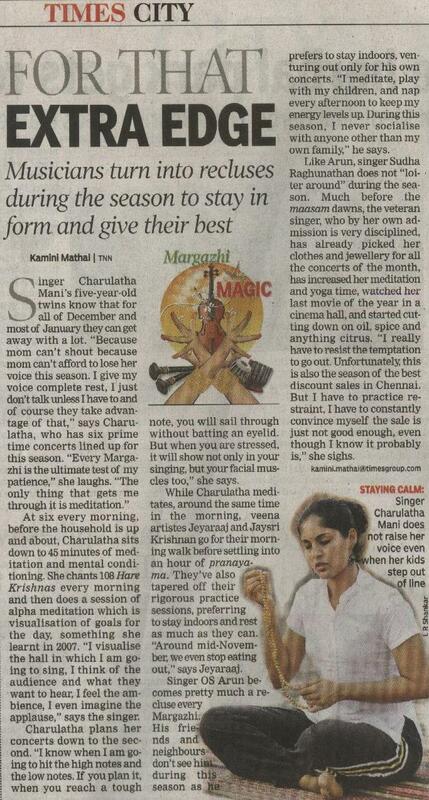 I recently spoke about my treasured possessions for the "Pettagam" show on Makkal TV. Let me tell you the story behind the "Best Vocalist Tambura prize" that I received from Shanti Arts Foundation Kutcheri contest back in 2002. I won a vintage Tambura presented by Sri Ramabhadran, of SAFE. 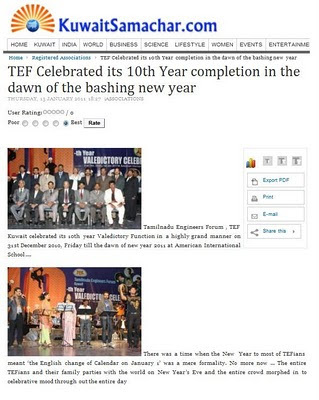 It was a week-long concert festival featuring various young singers. The judges including Sri K. S. Kalidas, mridangist, Sri. K. V. Krishnan, senior disciple of Sri Semmangudi, and Sri Chengalput Ranganathan, all highly accomplished seniors, awarded me the prize. I later learnt that the owner of the hall in which this was held, though neither a practitioner of the art nor even trained in it, took the liberty of opposing the decision of the veteran vidwans, all because he called himself a "patron" of music. He was firmly against giving me the prize, for reasons best known to him. Anyway, on that day, principle triumphed over pressure, and I won the prize. Talented youngsters who participate in the plethora of competitions held these days, should take it in their stride when they are ignored. It isn't necessarily a reflection on one's calibre. 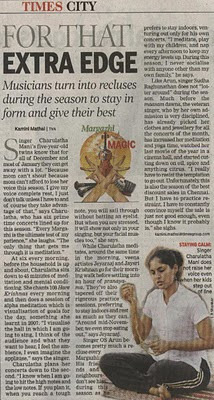 Most of the competitions I participated in as a young girl were won by persons who are nowhere to be seen today! Never be disheartened; keep following your Muse! 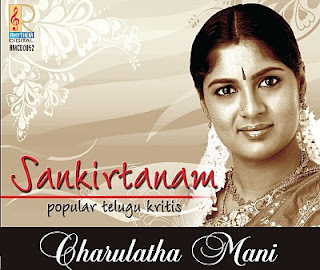 At a function on 16th July at Bharatiya Vidya Bhavan, Mylapore, singer Charulatha Mani’s latest albums produced by Rhythm Music - “Sankirtanam – Popular Telugu Kritis”, and “Isai Payanam – Live in UK” were released. 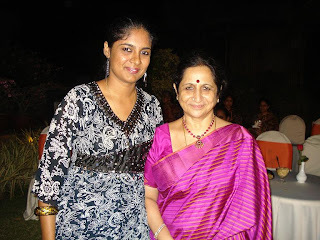 The chief guests of the evening were Sangita Kalanidhi Dr. N. Ramani, renowned flute maestro and Sri. S. Ve. 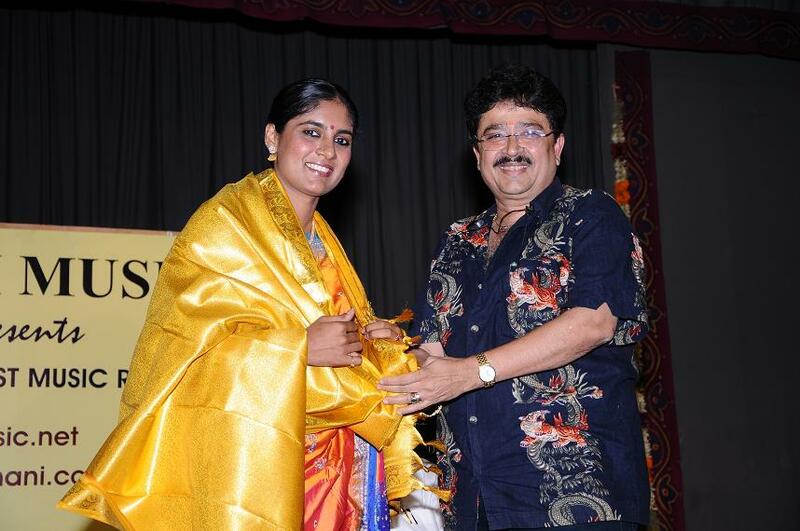 Shekher MLA, and Theatre Personality. 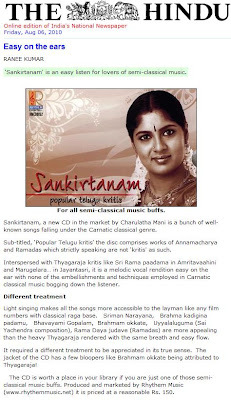 Sri Ramani said that Smt Charulatha Mani’s voice has a divine charm and that she has sung the Telugu songs with the correct pronunciation and devotional fervour. He blessed her for all her future endeavours. Sri S. Ve. 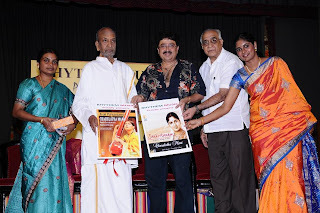 Shekher spoke on the album contents and praised the artiste's effort in presenting such an album to the rasikas of music. He also complimented the recording quality and said that the “Isai Payanam – Live in UK” is a treat to Classical music and film music lovers. 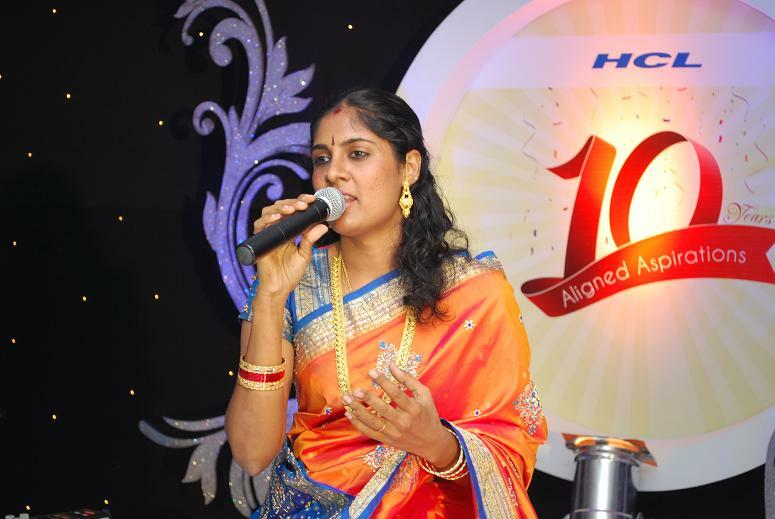 Smt R. Amaravathy, Proprietrix, Rhythm Audio too spoke on the occasion and expressed her gratitude to the artiste and the guests. The function was followed by Charulatha Mani’s “Sahitya Payanam” concert, in which she explained the meaning and background stories behind well-known classical kritis and then presented them in a concert form. She was accompanied by Sri Bombay Anand on the violin, and Sri Thillaisthanam Suryanarayanan on the mridangam. I was very happy to be the recipient of the "Kannadasan Award" for Best Playback Singer. Kannadasan is one of the most celebrated Tamil Film lyricists and his songs reflected simplicity and beauty coupled with intelligent usages of the language. He is hailed as "Kaviarasu" the king among poets. 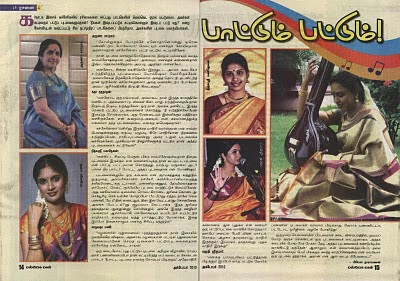 The songs of his tuned by M. S. Viswanathan and Ramamurthy are evergreen super-hits that always linger in the hearts of music lovers. I am a great fan of his songs and was thrilled to receive an award in his name, and that too from the veteran singer Sri P. B. Sreenivos! His "Kalangalil Aval Vasantham" still lingers in my mind. It was a nice evening at Rama Rao Kala Mantap, T. Nagar, and was covered by the Mega TV and organised by Ajanta Fine Arts. 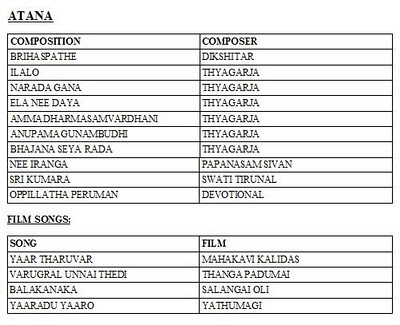 "Singampatti" song from movie "Veluthu Kattu"
I presented certain Dasar padas, Thyagaraja and Dikshitar kritis, Bhajans and Abhangs in addition to Tamil favourites since the audience there is a mix of Tamil speaking population and Malayalam, Kannada, Telugu and Hindi. Mr Ganesh, a music lover and organiser from Abu Dhabi took the initiative to bring me to UAE after listening to my live concert here in Chennai. Very meticulous organiser and nice person. 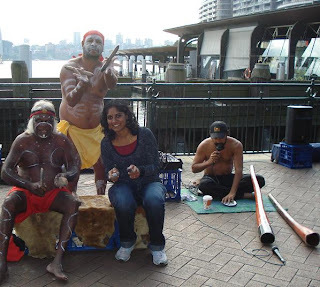 He and his wife Chandrika took great care of me, took me around after the concert, and we had lots of fun. 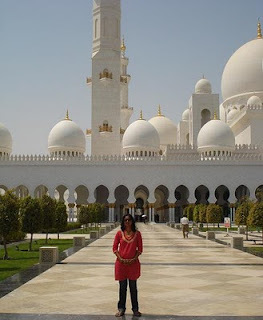 The visit to the Grand Mosque was unforgettable. Awe-inspiring architecture, marbled surfaces, hand painted windows, carpet, high ceilings, massive open-to-sky area...an experience to cherish. 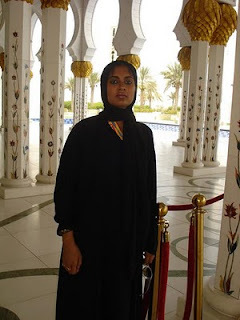 Wearing the burkha was a novel experience... I respect all religions and felt very calm and took in the spiritual vibrations. Shopping was a riot and I went crazy. If I had a few more days there I would have gladly blown up every last Dirham I possessed. SO COOL! 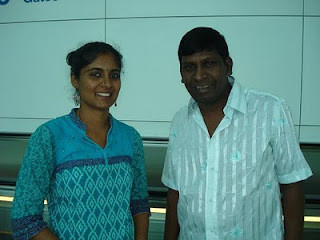 I met and chatted with popular comedian Mr.Vadivelu in the flight who was seated right behind me. I'm a big fan! It was a lovely day, a little rain, sunshine, and single digit temperatures at Melbourne, Australia. My Isai Payanam concert started at 4:30 pm at the Performing Arts Centre, Rowville. The hall is a beauty, with fine sound, good acoustic design and panelling. The hall was filled to its capacity of 500, and there were standees too. 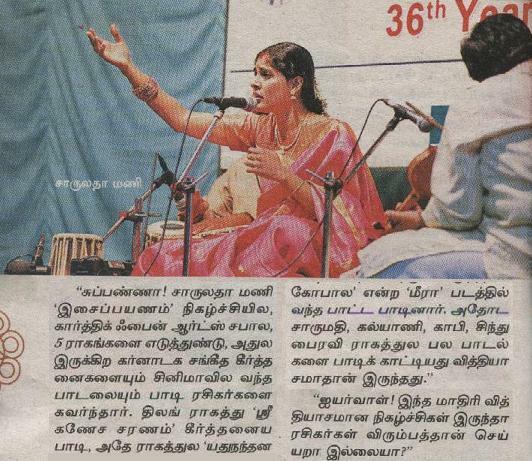 This was a fund raiser for the Vakrathunda Vinayagar Temple, Basin. Responsive, alert audience they were, with a huge appetite for music. 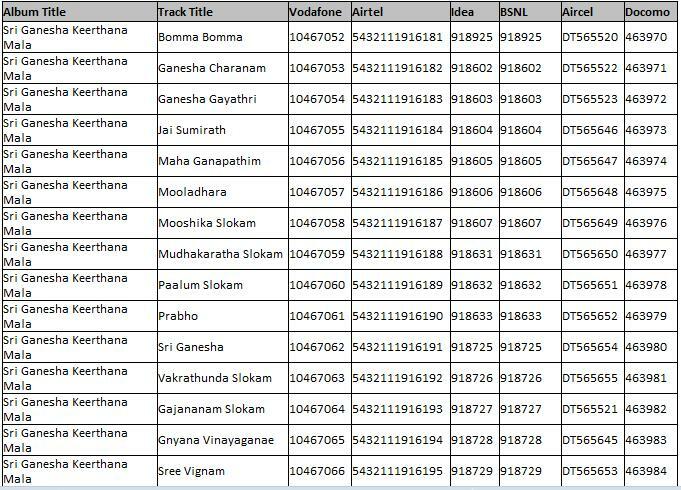 Several ragas were lapped up, Classical pieces, devotionals, film songs etc. were sung by me, and I was enjoying myself too. 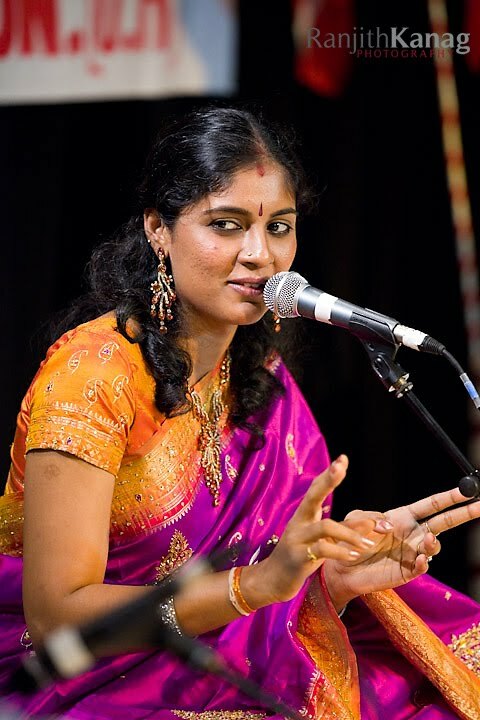 Accompanying me on stage were Nagaraj Iyer on the Violin, and Yogaraja Kandasamy, a leading mridangist in Australia, and a very talented young keyboardist, and morsing player, as well as Kannan on the tabla. The Indian Arts Association had arranged me a series of radio and TV interviews, promos, and had printed lovely brochures indicating program sequence, profiles of artistes etc. tastefully done. Mr Raj Nagarajan, President of the temple proposed the vote of thanks and the CD/DVD sales were awesome. We ran out of copies, but then we always do. 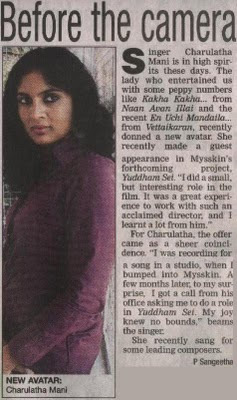 Thank you dear rasikas for making me a happy artiste!!! You may be wondering why this hiatus from blogging for dear Charu, but I assure you that I'm fine, in the pink of health, and just back to work after a most memorable vacation in Western and South Western Australia with my family. 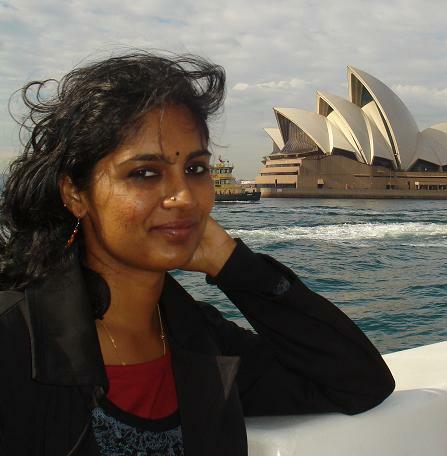 My concert at Sydney on May 23rd was well attended by Srilankans and South Indians alike. 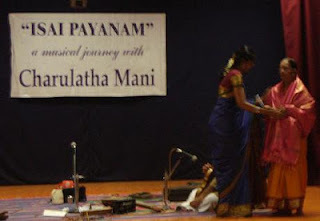 It was an Isai Payanam concert where I outlined ragas like Hamsadhwani, Dwijavanti, Sahana, Maand, Sindhubhairavi, Pantuvarali and others highlighting their classical and film features much to everyones delight. I had plenty of requests and the evening was long and exciting with lots of interaction with the crowd. The crowd consisted of young students and older seasoned rasikas. The day after the concert I did sight-seeing of Sydney - Darling Harbour, Centre Point tower, Opera House etc. Great fun. Wound up for the day by having dinner at a family friend's residence. 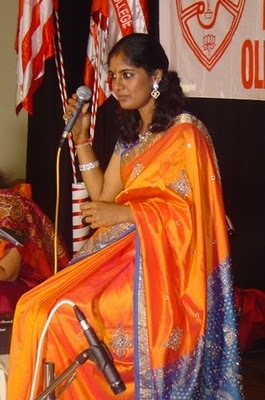 The concert was arranged by Sri Karpaga Vinayakar Temple, Homebush, Sydney, Australia.. It was a poolside dinner at Le Royal Meridien, and the guests included some of the most prominent persons in Chennai, including Smt. 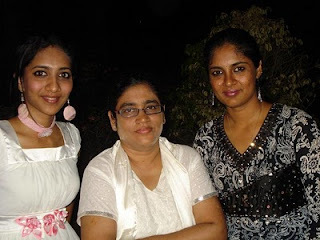 Aruna Sairam, Sri Narayanan of Seventh Channel, Madan Bob, A.R. Raihanah among others. 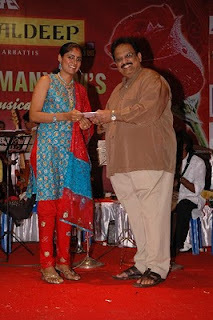 The party was hosted by Mr. Ravishankar of Bharani Minerals as a thank you gesture for the AR Rahman Salute concert. I had the rare honour of performing unplugged some of the melodious songs of AR Rahman before Smt. 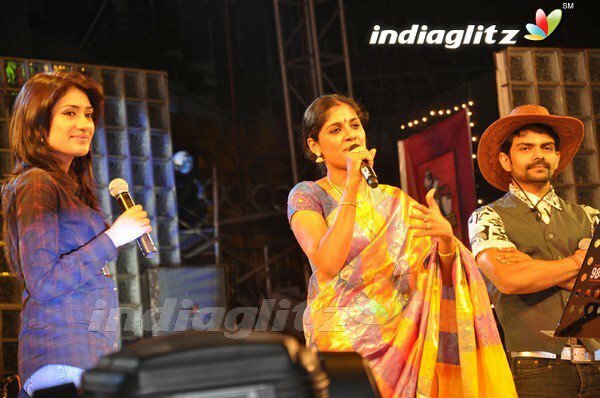 Aruna Sairam and Mr. Sairam. They said they loved it, and Aruna amma said "Hai Raama" in Pantuvarali is one of her favourites from the film Rangeela. It was a nice breezy evening and the Mouna Ragam orchestra had much to offer, with Srimathumitha singing "Porale Ponnuthayee" and "Idhu Varai" soulfully. Aruna Sairamji has heard my Classical music and all my rasikas know by now that I am greatly inspired by her music and persona, but I shall not forget this day when she sat back and enjoyed my film music offering as well. On 4th April, Kamarajar Arangam was packed to capacity. 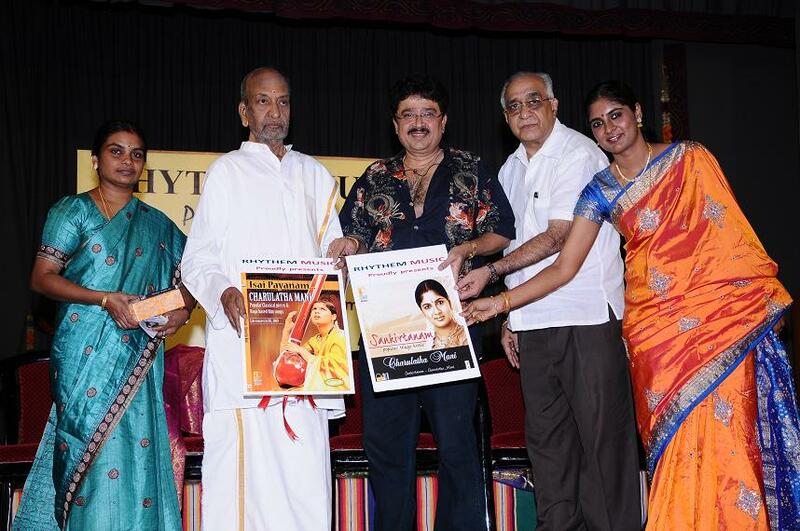 The occassion was a celebration of ARR's victories in the world of music. 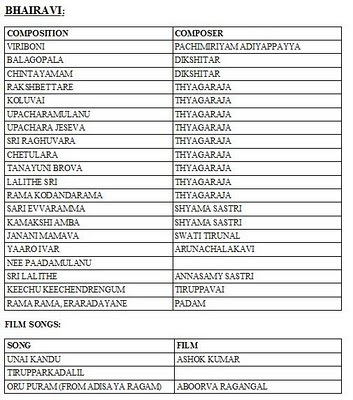 Various popular singers presented ARR's best songs. 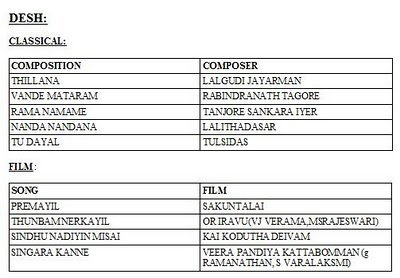 I had the honour of presenting "Maduraikku Pogathedi" from Azhagiya Tamizh Magan, a Vijay starrer (a prelude to "En Ucchi Mandaila!!). ARR's sister Raihanah was at the helm of affairs, meticulous in co-ordination. Well organised show. The back-stage was a fun place what with singers including Mano sir, myself, Prasanna, Velmurugan, Anantu, Ganga, and others jiving with the music. 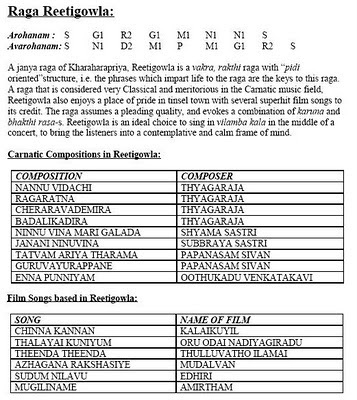 On March 28th, it was an evening to Tamizh compositions from Tevaram, to Divyaprabandam, Muthuthandavar, Arunachala Kavi, Gopalakrishna Bharati to Bharatiar and Bharatidasan, and finally Arunagirinathar. The highlights of the evening were Sabapathikku (Abhogi), Aadikondar (Mayamalavagowla), Enneramum (Poorvikalyani, Syama Sastri), Eppadi Manam (Huseni), among others. The Vani Mahal auditorium was full, and rasikas were receptive. I presented each piece preceded by a short introduction to the meaning and musical speciality of the item. I sang at the old and well-known Sri Rajagopala Swami Temple, Mannargudi a week ago, and was charmed by the temple's freshness despite being centuries old, the Sri Rajagopala shrine where He stands majestically flanked by Rukmini and Satyabhama, and the little vigraha of Santanagopalakrishnan (depicting "padaaravindena mukhaaravindam, mukharavindena viniveshayantam...", i.e putting the toe of his foot into his mouth as a child lying on the banyan leaf.) The godess Shenbagavalli thaayaar also known as Hemambujavalli is Mahalakshmi rupa. 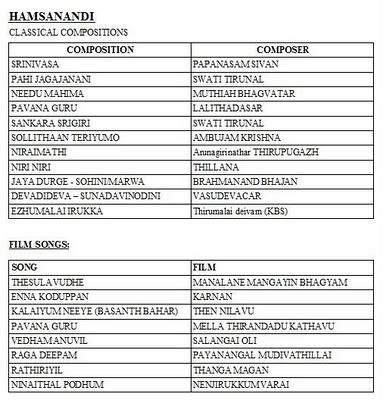 The concert's highlight pieces were Santanagopalakrishnam in Khamas, Mohanarama in Mohanam, Sobillu Saptaswara, Bantureeti, and Thirupaavai. It was the auspicious occasion of Sri Rama Navami, the birth of Lord Sri Ramachandra. 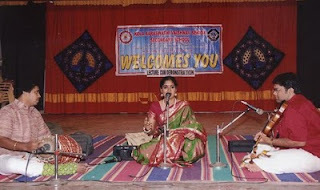 I performed at Sringeri Bharati Vidyashram, the Sharadambal Temple at T. Nagar for this occasion. This was followed by special darshan and puja, a memorable concert. 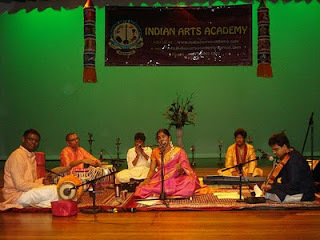 I was accompanied by B Anantakrishnan on the violin, S. J. Arjun Ganesh on Mridangam and Sundar on Morsing. It was a two and a half hour concert for Rajalakshmi Fine Arts at GKNM Hopital Audi, Coimbatore, on 7th March. Do you like the list? On 22nd February I gave a lecture demonstration to students of Kola Saraswati Vaishnav School at Kilpauk. They were children of classes 5 to 8. Very cherubic faced, enthusiastic kids. I started off with an introduction to Mayamalavagowla, then Malahari, Mohanam, Kapi, Kaanada etc. I asked them simple questions and they chorused the answers. 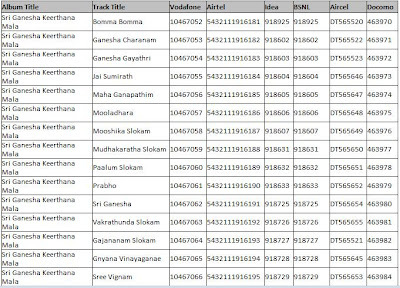 They sang along in Mohanam geetam "Vara Veena". The jubilation in their faces when they got an answer correct was something I will remember for a long time. Later requests came in for the show-stoppers like "Kurai Ondrum Illai" which I gladly fulfilled. I was their requested by the students (they screamed out loud) to sing "En Uchi Mandaila" from "Vettaikaran" at the end of the show. They sang that along too!!! It was a great pleasure to sing on stage with the living legend Dr SP Balasubramaniam on February 14th at Kamarajar Arangam, Chennai. 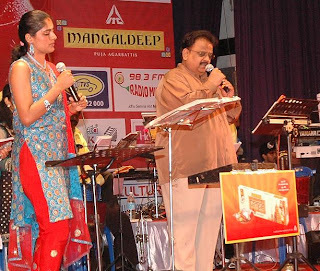 I sang the song from Vedham Pudhidu "Kannukkul Nooru Nilava" in Shanmukhapriya raga with him among other songs and he appreciated me on stage. It was a memorable moment for me. He also presented me with a memento. It was very refreshing to see his utmost sincerity and commitment towards music.